Gold and purple, superbly matching. "Pourpre de Bijou", is French for Purple Jewel. Indeed, this pair of earrings is bound to be the jewel of your collection. 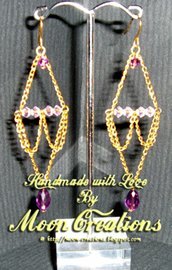 *All crystals as seen are genuine Swarovski diamond crystals and tear drop crystals.